We offer a unique experience for our customers who want to sell their Gold, Silver,and Platinum Precious Metals in Amarillo, Texas! We are open to the public, but will always respect your need for discretion. We offer the option to call ahead for an appointment where we will not allow other members of the public to come into the office during your transaction. Even if you do not call ahead and arrive to our store, please just let us know if you would like for us to let other customers know, who may arrive during your time here, that they will need to wait until our transaction is finished. We have found because of our fast, hassle-free service, TOP DOLLAR quotes and transactions flow so quickly for our customers, other customers do not mind waiting a few minutes to have their own private transaction. On top of this, we offer discrete, safe and secure locations. Many times if you visit a Pawn Shop or some of the other Precious Metal Buyers, they will allow others to come in and wait and eavesdrop on your transaction. We give every customer the opportunity to feel as safe, comfortable as possible, and conduct a private transaction, if the need be. We welcome you to give us a call or come by today for your own individual PRIVATE transaction. Just let us know that you have a need for a private experience and we will be more than happy to honor that for you. This is what makes Lone Star Gold and Silver Buyers of Amarillo, Texas so much different. Our #1 goal is for all of our customers to be treated fairly, and have the respect given to them that they deserve relating to their transaction, on top of being the most competitive paying Precious Metals Buyers in your area! At Lone Star Gold and Silver Buyers, we see high karat jewelry come in our doors often. More times than not, folks are quick to say "I don't think this is real." or "The place i went to before here, doesn't believe this to be real." High Karat Gold Jewelry has a very different look from the traditional 10k, 14k, 18k Jewelry we are all mostly used to seeing. It has a buttery look, and EXTREMELY yellow. Understandably as most of us are not used to seeing genuine gold jewelry with this look, too often it is mistaken for costume jewelry. 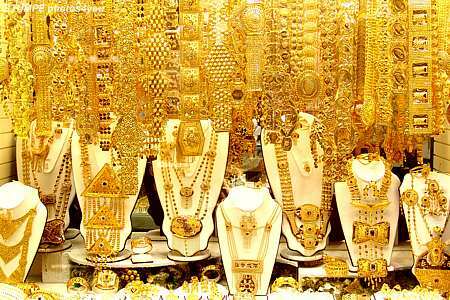 Most of this high karat jewelry comes from overseas. In particular from India, Thailand, and many areas in the Middle East. This gold ranges in purity from from 20k to 24k. We are able to quickly determine the purity using our XRF Machine (Xray). No scratching, placing acids or damaging your jewelry at Lone Star Gold and Silver Buyers! Don't throw out that lot of Costume Jewelry, or sell it in a Garage Sale just based on how it looks. If it is non magnetic, and heavy, we highly suggest you have it checked out. Lone Star Gold and Silver Buyers are always competitive on our Gold and Silver payouts. 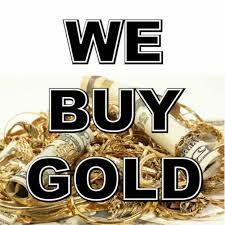 We pride ourselves on our honesty, and hassle free Gold and Silver Selling Process. All silver will tarnish. It’s an unfortunate fact of life. But you would think that the way people talk about it that they had just contracted some terminal illness. Tarnish/Toning is actually a very normal thing in the world of Silver Coins. Down to the the nitty-gritty. Tarnish is a chemical reaction that occurs when silver comes into contact with humidity and chemicals in the air which causes silver to lose its beautiful luster. When the atoms of silver come into contact with oxygen, a layer of silver oxide is created as a protective barrier – much like rust. However, unlike rust, silver tarnish is self-limiting and the underlying layers are not affected by the outer layers of tarnish. This not only happens to silver, but also happens to copper, aluminum, brass and other similar, soft metals. Tarnishing is simply the product of oxidation. When strictly speaking about tarnish on coins, the term “toning” is the preferred vernacular. Toning on coins is sometimes a desirable trait that is all subjective. We’ve all heard the term “Beauty is in the eye of the beholder.” That term could never be more apparent than when it concerns coins. Some people prefer crisp, pristine, “white” silver coins. However, some people love the beauty of rainbow-toned silver Morgan Dollars. 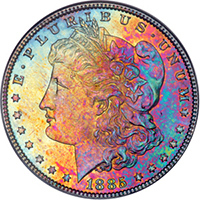 Rainbow toning in Morgan Dollars is more common than in other silver coins. This is because many coins were stored in U.S. Treasury vaults in canvas bags for decades and in some cases (The Battle Creek and Continental Bank Hoard) for up to a century. The coins that were closest to the canvas were constantly in contact with a tiny concentration of sulfur. Sulfur was used in the bags to prevent rats from chewing through them. The silver in the coins reacted with the sulfur to form a thin layer of silver-sulfide. It is that thin film that refracts the light and creates the beautiful rainbow toning seen on many toned Morgan Dollars. How Can I Protect My Coins From Tarnish? The best way to prevent coins from developing toning is to limit their exposure to the elements. For example, a basement is normally not a good place to store your coin collection because basements often contain higher rates of humidity than compared to the rest of the house. The best way to store your precious metals would be to have them stored in a hermetically sealed chamber (void of any air or gas) and have them not be in contact with any surface (impossible considering we have gravity). However, since this is a near impossibility, you’ll want to store your precious metals with as little contact to the air and elements as possible. NEVER ATTEMPT TO "CLEAN" A COIN! IF YOU ACCIDENTALLY CLEAN A COIN WITH NUMISMATIC VALUE (RARE, KEY DATE, ETC.) YOU RUN THE VERY LIKELY CHANCE OF DRASTICALLY LOWERING THE VALUE OF YOUR COIN! SILVER COINS CAN RUN IN VALUE FROM THE ACTUAL SILVER WEIGHT VALUE TO EXAMPLES OF RARE MINTS AND DATES THAT THE SKY IS THE LIMIT! At Lone Star Gold and Silver Buyers of Amarillo, Texas we are always PAYING TOP DOLLAR ON YOUR SILVER COINS! GIVE US A CALL OR COME BY TODAY FOR A QUICK, HASSLE FREE, TOP DOLLAR QUOTE. In addition to pledging to pay absolute TOP DOLLAR for your Gold, Silver, Platinum and Palladium we offer MUCH MORE THAN THAT. We are Precious Metal Experts. NOTHING MORE, NOTHING LESS. We utilize state of the art XRF X-Ray technology to harmlessly test and assay your items. WE DO NOT SCRATCH, FILE, OR PLACE ACIDS on your precious metal items. With this being said we pledge to honor a private transaction in a comfortable, clean and SAFE office. We pledge to treat you with dignity and respect. We pledge to give you a FREE NO HASSLE QUOTE. There will be no pressure, no sales pitch, no excuses or reasons why we cannot offer you a TOP DOLLAR quote. We are upfront with you on the total metal value, and the maximum amount we can pay you. NO SMOKE AND MIRRORS AT LONE STAR GOLD AND SILVER BUYERS! We focus solely on Precious Metals. It doesn't matter what it is, if it is Gold, Silver, Platinum or Palladium-- WE BUY IT! We DON'T do gift card buying, text book buying, or anything not directly associated with the PRECIOUS METALS MARKET. Rest assured you will be doing business with a Family Owned Operation with morals and a devotion to incredible CUSTOMER SERVICE. NO FRILLS. NO OVER THE TOP SIGN PEOPLE OUT ON THE ROAD, NO FALSE CLAIMS. Please give us a call or come by today and see for yourself why it PAYS to do business with LONE STAR GOLD AND SILVER BUYERS! ALWAYS make sure when selling your jewelry and other precious metal items you are dealing with a Licensed Precious Metal Dealer. When contacting or visiting a potential buyer it is always a good idea to ask for their State of Texas Certificate of Registration. Any honest Gold and Silver Buyer will be more than happy to supply that information. When your items are being tested and weighed, it is also a very good idea to verify the weights on the scales. If they are unwilling to let you see the weight, then proceed with caution. Precious Metals dealers are obligated to register and have their scales inspected and verified by the Texas Department of Agriculture as well. Lone Star Gold and Silver Buyers in Amarillo, South Houston, and San Antonio Texas value our integrity and honesty and will always be fair and honest with our customers. Below are some tips regarding purchasing gold jewelry and things you need to look for to make sure you are buying genuine gold or silver jewelry. Lots of counterfeits and fakes are being sold these days. We want our customers to be as educated as possible. When you buy gold jewelry, look for the karat quality mark. The karat mark should tell you how much pure gold is in the piece. Near the karat quality mark, you should see the name or the U.S. registered trademark of the company that will stand behind the mark. The trademark may be in the form of a name, a symbol, or initials. If you’re considering a piece of gold jewelry but don’t see a trademark along with the karat mark, don’t buy it. “Solid Gold” refers to any gold item where the inside of the item is not hollow. The karat mark still will denote the proportion of gold to other metal. Gold Plated Jewelry can be plated with gold by mechanical plating, electroplating, and other processes. Eventually, gold plating wears away. How soon depends on how often the item is worn and how thick the plating is. If the layer of gold is less than 1/20 of the weight of the metal in the entire item, any marking should state the fraction of karat gold (for example, 1/40 14K gold overlay). “Gold electroplate” describes jewelry that has a layer (at least .175 microns) of at least 10 karat gold applied on a base metal by an electrolytic process. 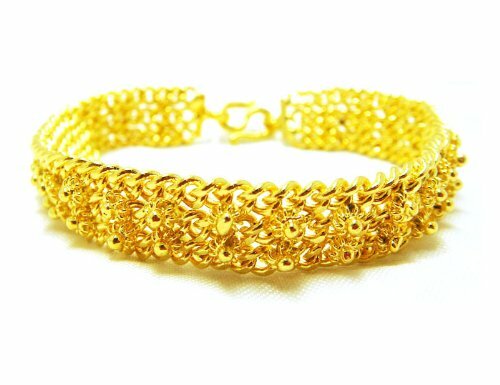 Vermeil, a special type of gold plated product, consists of a base of sterling silver that is coated or plated with gold. Gold Flashed or Gold Washed: The terms “gold flashed” and “gold washed” describe products that have an extremely thin electroplating of gold (less than .175 microns). This will wear away faster than gold plate, gold filled, or gold electroplate. ﻿Silver Jewelry. The words ”sterling silver” describe a product that contains 92.5% pure silver. Silver products sometimes may be marked 925, which means that 925 parts per thousand are pure silver. Generally speaking "Fine Silver" or "Pure Silver" usually only applies to Silver Bullion. In these cases it is customary to see ".999" or "Fine Silver. Very uncommon to have "Fine Silver" Jewelry, but it does exist. Some jewelry described as ”silver plate” has a layer of silver applied to a base metal. EP, falls into this category and means "electro plated"
”Coin silver” is used for compounds that contain 90% pure silver. According to the law, quality-marked silver also must bear the name or a U.S. registered trademark of the company or person that will stand behind the mark. Please keep in mind these are U.S. laws, and jewelry manufactured outside of the U.S. may not be subject to these laws. 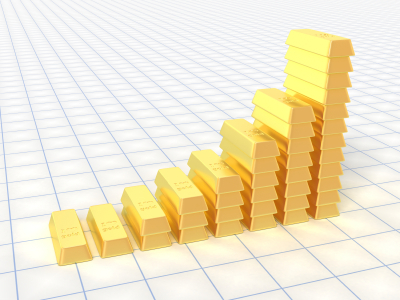 Ever Wonder Why the Price of Gold Fluctuates so Often? Gold is bright yellow and has a high luster. Apart from copper and caesium it is the only non white colored metal. Gold’s attractive warm colour has led to its widespread use in decoration. The arrangement of outer electrons around the gold nucleus is the reason for the yellow color; to be precise, the transition of electrons from the d band to unoccupied positions in the conduction band. Finely divided gold, like other metallic powders, is black; colloidally suspended gold ranges in color from ruby red to purple.Gold can mixed with other metals to give it different colors. White gold is very popular right now. It can be in 18-karat or 14-karat gold (but not in 22-karat, as it is yellow gold). There are two basic types of white gold alloys: white gold mixed with nickel and white gold mixed with palladium. Nickel can be mixed with gold to create a white or gray color, but some people have an allergy to nickel. Palladium is another metal used to create white gold. Palladium is better but it costs more. To enhance the whiteness, almost all white gold is plated with rhodium, a shiny, white metal which is extremely hard. Depending on the amount of wear to a piece of jewelry, over time this rhodium plating may wear off, revealing the original metal color. Copper creates pink and rose tones in gold.The more the copper, the deeper will be the effect. Greenish shades are created by adding silver to gold while excluding copper from the mix. 18K green gold can be made from 75% gold and 25% silver. Cadmium can be incorporated to vary the tint of green. So combining 75% gold and 23% copper with 2% cadmium creates a light green, while 75% gold, 15% silver, 6% copper and 4% cadmium creates a dark green. Rose gold and Green gold can be 18-karat or 14-karat but the color is stronger in the 14-karat alloys. Purple gold. It is referred as amethyst or violet gold. Purple gold is obtained by mixing gold and aluminium in a certain fixed ratio. Gold content is almost 79% and therefore it is qualified to be referred to as 18K gold. Blue gold is made as an inter-metallic compound between gold and indium . The gold gets a bluish hue color with this process. Black gold is created using a few techniques. Electro-deposition using black rhodium or ruthenium is the first technique. Controlled oxidation of Carat gold containing cobalt or chromium can also be made to create black gold. Amorphous carbon is also used some times, with the Plasma Assisted Chemical Vapor Deposition process. It is a GOOD TIME to Sell your Gold Jewlery! It is a safe bet to say that gold will remain between $1,200 and $1,400 for the immediate future. This means that when you sell your scrap gold, the cash you earn should not be too much different one week to the next. There is no point in waiting, especially if you need money now, unless you have significant amounts of gold to sell. If you have over an ounce, then analyzing the price changes will benefit you. But most people only sell scrap gold a few grams at a time. Whether it is right now, or next week, whenever you need money fast is the best time to sell scrap gold and jewelry. A $10 difference in the price of gold will not affect your cash for gold payout noticeably, so sell your gold when you need to! There are as many reasons to sell gold jewelry for scrap. 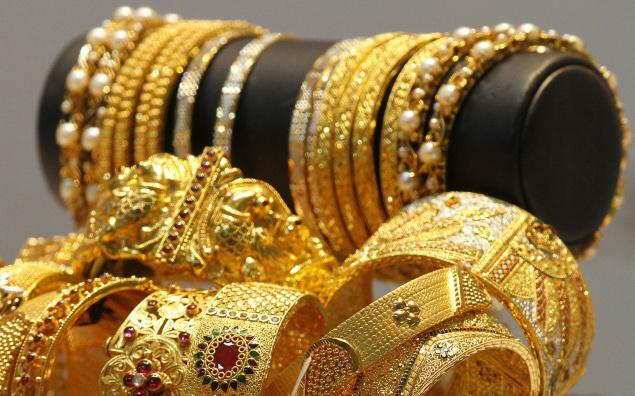 If one of the below reasons is your own situation, now is the right time to sell gold jewelry. If you have earrings without mates, a brooch with a busted clasp, an old watch that doesn’t tell time, or a chain that is twisted and kinked, you may keep thinking to yourself, “Someday I will get this fixed.” If you haven’t done it by now, will it ever happen? You’d be surprised at the price of jewelry repair these days. The careful dexterity required as well as the relative softness of gold jewelry means a large bill for getting the damage repaired. Most people have very selective taste in jewelry so finding a buyer for older, dated jewelry can be hard. It can be a tedious task to find a prospect for outdated jewelry and there is no guarantee you will ever find interested customers. At Lone Star Gold and Silver Buyers, we are always ready to buy from you, and we don’t care about the condition or style of your old jewelry. Our promise is that we will not penalize you on the payment just because your jewelry is ugly and old! Lone Star Gold and Silver Buyers GUARANTEES TOP DOLLAR PAID ON YOUR GOLD and SILVER Jewelry! We also buy Silver Jewelry scrap or not, Gold Coins, Silver Coins, Junk Silver, Sterling Flatware, Platters, and Serving Dishes (stamped Sterling), Bullion, Platinum and Palladium! What Makes Lone Star Gold and Silver Buyers different from all the other "We Buy Gold" places and pawn shops? There are many things that makes us stand out, but one of the largest reasons is our state of the art X-ray machines. 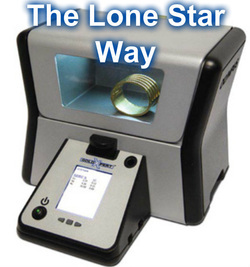 Lone Star Gold and Silver Buyers do NOT scratch or file your jewelry, coins and other precious metal items. Most other places will. 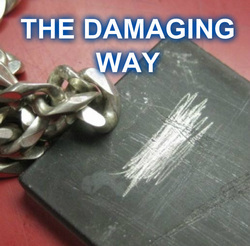 They damage your precious metal items and then what if you are not OK with their offer?? You are left with a significantly noticeable scratch mark and damage on your valuable items. We feel that your jewelry and other items should be handled in a manner where you are left with it, in the same condition as it walked in our door. We welcome you to come by for a quote and see the difference and why it PAYS to sell your Gold, Silver, and Platinum items to Lone Star Gold and Silver Buyers. Fast, Hassle-Free, Honest. We Pay Top Dollar EVERYDAY, Guaranteed. We Buy Gold, Silver, Platinum, Bullion, Coins, Jewelry, Dental Gold, Sterling Silver Flatware and Platters and pay the highest prices in Amarillo, Houston, and San Antonio, Texas. Guaranteed! You can tell Gold-filled by the quality mark along with the manufacturer's Trademark stamped on each piece. Gold-filled must have a quality mark that will identify its Karat. For example, 1/20 12K GF and 1/20 14K GF. This means that the pieces are 1/20th 12K Gold by weight or 1/20th 14K Gold by weight. We do buy Gold-filled, but it is substantially less money than Gold. Gold-plated jewelry has zero Gold Value, the Gold color will eventually wear off as it comes into contact with the wearer's skin salts or pollutants in the air. Of course, it can inexpensively be replaced with another piece of Gold-plated jewelry.